Support for AMD A68 chipset and FM2/FM2+ socket processor(TDP: 65W), provides a high performance. 2 * DIMM slots, support dual channel DDR3 1866/1600. Hi-Fi isolated audio line reducing interference and delivering a clear sound with exceptional acoustics and realism. Short-circuit protection, ESD protection--protect your motherboard from electrostatic damage, LAN surge protection--protect against LAN surges and lightning strikes, TVS diode protection--protect against current or voltage surge. SATA 3.0 6Gb/s increase the data transfer rate between the motherboard and internal storage devices. Full solid capacitors provide a more stable power supply even under high temperatures ensure a longer lifespan and boost the ultimate performance. Based on AMD A68 chipset increasing stability and speeding up system performance, the MAXSUN MS-A68GT+ supports FM2/FM2+ socket processors and integrates dual channel DDR3 memory controller. Along with PS/2 for keyboard and mouse, built-in all solid capacitors ensure an extended lifetime and stable power supply, equipped with audio segment line delivering high fidelity clear sound. 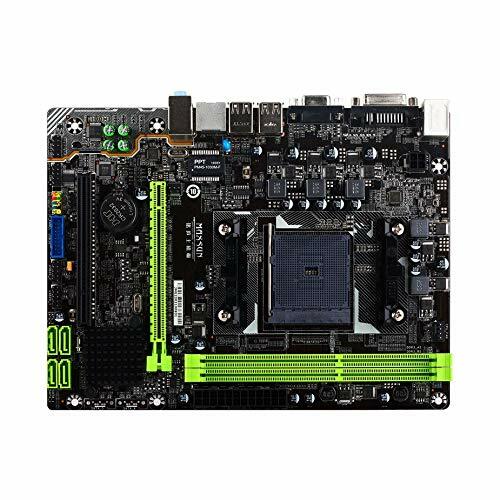 It works flawlessly for your personal gaming/media build, and its reasonable cost and ease-of-use make it a perfect choice for gamers, enthusiasts, seasoned or new builders.